An amphibious vehicle (or simply amphibian), is a vehicle that is a means of transport, viable on land as well as on (or under) water. Amphibious vehicles include amphibious bicycles, ATVs, cars, buses, trucks, military vehicles, boats and hovercraft. Classic landing craft are not amphibious vehicles as they do not offer any real land transportation at all, although they are part of amphibious warfare. Ground effect vehicles, such as ekranoplans, will likely crash on any but the flattest of landmasses so are also not considered to be amphibious vehicles. Amphibious tour bus - a converted DUKW - on Thames river in London near Lambeth Bridge. Apart from the distinction in sizes mentioned above, two main categories of amphibious vehicles are immediately apparent: those that travel on an air-cushion (Hovercraft) and those that do not. Amongst the latter, many designs were prompted by the desire to expand the off-road capabilities of land-vehicles to an "all-terrain" ability, in some cases not only focused on creating a transport that will work on land and water, but also on intermediates like ice, snow, mud, marsh, swamp etc. This explains why many designs use tracks in addition to or instead of wheels, and in some cases even resort to articulated body configurations or other unconventional designs such as screw-propelled vehicles which use auger-like barrels which propel a vehicle through muddy terrain with a twisting motion. 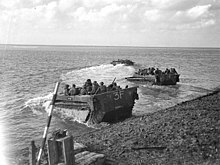 Most land vehicles – even lightly armoured ones – can be made amphibious simply by providing them with a waterproof hull and perhaps a propeller. This is possible as a vehicle's displacement is usually greater than its weight, and thus it will float. Heavily armoured vehicles however sometimes have a density greater than water (their weight in kilograms exceeds their volume in litres) and will need additional buoyancy measures. These can take the form of inflatable floatation devices, much like the sides of a rubber dinghy, or a waterproof fabric skirt raised from the top perimeter of the vehicle, to increase its displacement. For propulsion in or on the water some vehicles simply make do by spinning their wheels or tracks, while others can power their way forward more effectively using (additional) screw propeller(s) or water jet(s). Most amphibians will work only as a displacement hull when in the water – only a small number of designs have the capability to raise out of the water when speed is gained, to achieve high velocity hydroplaning, skimming over the water surface like speedboats. Some of the earliest known amphibious vehicles were amphibious carriages, the invention of which is credited to the Neapolitan polymath Prince Raimondo di Sangro of Sansevero  in July 1770 or earlier, or Samuel Bentham whose design of 1781 was built in June 1787. The first known self-propelled amphibious vehicle, a steam-powered wheeled dredging barge, named the Orukter Amphibolos, was conceived and built by United States inventor Oliver Evans in 1805, although it is disputed to have successfully travelled over land or water under its own steam. Inventor Gail Borden, better known for condensed milk, designed and tested a sail-powered wagon in 1849. On testing, it reportedly tipped over 50 feet (15 m) from shore, from an apparent lack of ballast to counteract the force of the wind in the sail. In the 1870s, logging companies in eastern Canada and the northern United States developed a steam-powered amphibious tug called an "Alligator" which could cross between lakes and rivers. The most successful Alligator tugs were produced by the firm of West and Peachey in Simcoe, Ontario. Until the late 1920s, the efforts to unify a boat and an automobile mostly came down to simply putting wheels and axles on a boat hull, or getting a rolling chassis to float by blending a boat-like hull with the car's frame. One of the first reasonably well-documented cases was the 1905 amphibious petrol-powered carriage of T. Richmond (Jessup, Iowa, USA). Just like the world's first petrol-powered automobile (1885, Carl Benz), it was a three-wheeler. The single front wheel provided direction, both on land and in the water. A three-cylinder petrol combustion-engine powered the oversized rear wheels. In order to get the wheels to provide propulsion in the water, fins or buckets would be attached to the rear wheel spokes. Remarkably the boat-like hull was one of the first integral bodies ever used on a car. Since the 1920s, many diverse amphibious vehicles designs have been created for a broad range of applications, including recreation, expeditions, search & rescue, and military, leading to a myriad of concepts and variants. In some of them, the amphibious capabilities are central to their purpose, whereas in others they are only an expansion to what has remained primarily a watercraft or a land vehicle. The design that came together with all the features needed for a practical all-terrain amphibious vehicle was by Peter Prell of New Jersey. His design, unlike others, could operate not only on rivers and lakes but the sea and did not require firm ground to enter or exit the water. It combined a boat-like hull with tank-like tracks. In 1931, he tested a scaled down version of his invention. Recently, Gibbs Amphibians has developed a new type of amphibian, one capable of high speeds on both land and water. The vehicles use a patented hydraulic system to raise the wheels into the wheel wells, allowing the vehicles to plane on water. These vehicles can transition between land and water modes in about five seconds. The first Gibbs fast amphibian is the Quadski, introduced in October 2012. It went on sale in January 2013. Iguana Yachts, a French company created in 2008, has developed amphibious motorboats featuring all-terrain tracks. Sealegs Amphibious Craft, a three-wheeled amphibious boat designed in New Zealand, has been in production since 2005. Water Car Panther driving at High Speeds on Lake Havasu, AZ. In 2010, a Southern California-based company named WaterCar, set the Guinness World Record for Fastest Amphibious Vehicle, with their prototype, The Python, which reached top land speeds of 204 km/h (127 mph) and water speeds of 96 km/h (60 mph; 52 knots). Since then, the company launched their first commercial vehicle, The Panther, which has been featured on ABC's The Bachelor as well as USA's Royal Pains. The WaterCar can do 80 mph (129 km/h) on land, and 44 mph (38 knots; 71 km/h) on sea, and can transition from land to sea in less than 15 seconds. An amphibious cycle is a human-powered vehicle capable of operation on both land and water. "Saidullah's Bicycle" uses four rectangular air filled floats for buoyancy, and is propelled using two fan blades which are attached to the spokes. Moraga's "Cyclo Amphibious" uses a simple tricycle frame to support three floaters which provide both the floatation and thrust. The wings on the powered wheels propel the vehicle in a similar way to a paddle wheel. The SBK Engineering Shuttle-Bike consists of two inflatable floats with straps that allow the carrying of a bicycle with a passenger. The ensemble, when deflated, fits in a backpack for carrying by the cyclist. Several amphibious cycles have been created by engineering students as university projects. Gibbs Sports Amphibians Inc. introduced a motorized version of the amphibious cycle that resembles a jet ski on water and motorcycle on land. The model can reach up to 80 mph by land and 45 mph by water. Amongst the smallest non air-cushioned amphibious vehicles are amphibious ATVs (all-terrain vehicles). These saw significant popularity in North America during the 1960s and early 70s. Typically an amphibious ATV (AATV) is a small, lightweight, off-highway vehicle, constructed from an integral hard plastic or fibreglass bodytub, fitted with six (sometimes eight) driven wheels, with low pressure, balloon tires. With no suspension (other than what the tires offer) and no steering wheels, directional control is accomplished through skid-steering – just as on a tracked vehicle – either by braking the wheels on the side where you want to turn or by applying more throttle to the wheels on the opposite side. Most contemporary designs use garden tractor type engines, that will provide roughly 25 mph (40 km/h) top speed on land. Constructed this way, an AATV will float with ample freeboard and is capable of traversing swamps, ponds, and streams as well as dry land. On land these units have high grip and great off-road ability, that can be further enhanced with an optional set of tracks that can be mounted directly onto the wheels. Although the spinning action of the tires is enough to propel the vehicle through the water – albeit slowly – outboard motors can be added for extended water use. In October 2013, Gibbs Amphibians introduced the long-awaited Quadski, the first amphibious vehicle capable of traveling 45 mph on land or water. The Quadski was developed using Gibbs' High-Speed Amphibian technology, which Gibbs originally developed for the Aquada, an amphibious car, which the company has still not produced because of regulatory issues. Amphibious automobiles have been conceived from ca. 1900, however the Second World War significantly stimulated their development. Two of the most significant amphibious cars to date were developed during World War II. The most proliferous was the German Schwimmwagen, a small jeep-like 4x4 vehicle designed by the Porsche engineering firm in 1942 and widely used in World War II. The amphibious bodywork was designed by Erwin Komenda, the firm's body construction designer, using the engine and drive train of the Kübelwagen. An amphibious version of the Willys MB jeep, the Ford GPA or 'Seep' (short for Sea jeep) was developed during World War II as well. A specially modified GPA, called Half-Safe, was driven and sailed around the world by Australian Ben Carlin in the 1950s. The Southern California-based company, WaterCar, founded by Dave March, has also built four working amphibious prototypes, one which holds the Guinness World Record for World's Fastest Amphibious Vehicle (The Python). In 2013, March released the company's first commercial vehicle, The Panther. Since its release, WaterCar has been popular in the Middle East, selling to the Embassy of the United Arab Emirates, with six additional vehicles being sold to the Crown Prince of Dubai. The WaterCar has also been sold to tech enthusiasts and residents of Silicon Valley. Other amphibious cars include the US Hydra Spyder and the Spira4u. 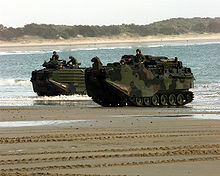 Some amphibious vehicles, rather than being designed for land transport with the ability to cross water, are designed as water-transport vehicles with the ability to travel on land. The distinction is that the vehicles are designed to be high performing on water, with the land transport ability added to give additional functionality, rather than being the main function. Sealegs Amphibious Craft are an example of this, which are a range of aluminium fabricated boats (mostly RIBs) designed and manufactured in Auckland, New Zealand. These craft can travel up to 39 knots on water, but travel at only 7.5 km/hr on land, showing the preference for water performance in design. Various versions of this type of amphibious boat design have been produced, including the Iguana Yacht (covered in the “Tracked” section below). Since 1977, several boat builders in Brittany have built specialized amphibious vehicles for use in the area's mussel and oyster farming industries. The boats are made of aluminium, are relatively flat-bottomed, and have three, four, or six wheels, depending on the size of the boat. When the tide is out the boats can run on the tidal flats using their wheels. When the tide is in, they use a propeller to move through the water. Oyster farmers in Jersey make use of similar boats. Currently, Constructions Maritimes du Vivier Amphibie has a range of models. During the Vietnam War, the US Army used the amphibious articulated Gama Goat and the larger M520 Goer truck-series to move supplies through the canals and rice paddies of Southeast Asia. The latter was based on a 1950s civil construction vehicle and became the US Army's standard heavy tactical truck before its replacement by the HEMTT. Although the vehicles' wheels were mounted without suspension or steering action, and land speeds over 20 mph (32 km/h) were ill-advised, its articulated design provided it with good maneuverability and helped it to keep all four wheels firmly in touch with uneven ground. Coupled with its amphibious capability, in the Vietnam War, the M520 Goer developed a reputation of being able to go where other trucks could not. Many modern military vehicles, ranging from light wheeled command and reconnaissance vehicles, through armoured personnel carriers (APCs), tanks and amphibious warfare ships, are manufactured with amphibious capabilities. The French Panhard VBL is a compact, lightly armored 4x4 all-terrain vehicle that is fully amphibious and can swim at 5.4 km/h (3.4 mph). The VAB is a French fully amphibious APC, powered in the water by two water jets, mounted one on either side of the rear hull (see detail picture above). It entered service in 1976 and around 5000 were produced in many configurations. During the Cold War the Soviet bloc states developed a number of amphibious APCs, fighting vehicles and tanks, both wheeled and tracked. Most of the vehicles the Soviets designed were amphibious or could ford deep water. Wheeled examples are the BRDM-1 and BRDM-2 4x4 armored scout cars, as well as the BTR-60, BTR-70, BTR-80 and BTR-94 8x8 APCs and the BTR-90 infantry fighting vehicle. A French company, Iguana Yachts, has developed boats featuring tracks to assist launch and recovery. The M29 Weasel (Studebaker Weasel), whilst originally designed as a snow vehicle, operated successfully in an amphibious role by the addition of front and rear floats. The basic vehicle will float but its bow is square so the additional floats add stability and load carrying capacity. Tracked armored vehicles with amphibious capabilities include those that are intended for use in amphibious assault. The United States started developing a long line of LVT (Landing Vehicle Tracked) designs from around 1940. Many tracked armored vehicles that are primarily intended for land-use, such as armoured fighting vehicles and armoured personnel carriers nevertheless also have amphibious ability, tactically useful inland, reducing dependence on destroyable and easily targeted bridges. To provide motive power, they use their tracks, sometimes with an added propeller or water jets. As long as the opposite bank has a shallow enough slope for the vehicle to climb out within a few miles, they can cross rivers and water obstacles. An American example is the M113 Armored Personnel Carrier. Soviet examples are the PT-76 amphibious tank, and the BTR-50 and MT-LB APCs based on its chassis. At the end of World War I a Mark IX tank had airdrums attached to the side and was tested as an Amphibious vehicle. By the early 1930s, Vickers had developed an amphibious tank. By using very thin armour, flotation could be achieved without external buoyancy aids. The British Army trialled the Vickers-Carden-Loyd Light Amphibious Tank but did not adopt it for service use. An order was placed with Vickers by the USSR for a small number of tanks. After negotiations to purchase the Vickers tank by Poland failed, they developed their own design the PZInż 130 but dropped the idea of amphibious tanks as obsolete. 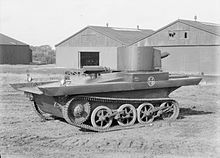 A pontoon based tank, the L1E3, was produced by Vickers in 1939. In World War II the British further developed amphibious tanks. The Crusader was trialled with two pontoons that could be attached or removed, the tracks driving the tank in the water. 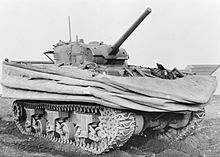 The "Medium Tank A/T 1" was a tank with inbuilt buoyancy some 24 ft (7.3 m) long and 11 ft (3.4 m) tall. The Valentine, then the M4 Sherman medium tank were made amphibious with the addition of a rubberized canvas screen to provide additional buoyancy and propellers driven by the main engine to give propulsion. These were DD tanks (from "Duplex Drive") and the Sherman DD was used on D-Day to provide close fire support on the beaches during the initial landings. The Sherman DD could not fire when afloat as the buoyancy screen was higher than the gun. A number swamped and sank in the operation, due to rough weather in the English Channel (with some tanks having been launched too far out), and to turning in the current to converge on a specific point on the battlefield, which allowed waves to breach over the screens. Those making it ashore, however, provided essential fire support in the first critical hours. Before World War II, The Soviets produced light amphibious tanks called T-37 and T-38. A third serial model, T-40, started production after the beginning of the war. A 14-ton tank, PT-1 was created but was not mass-produced. In addition, an attempt was made to attach pontoons to T-26. While successful, the project was closed due to the high vulnerability and unwieldiness of the construction. Some light tanks such as the PT-76 are amphibious, typically being propelled in the water by hydrojets or by their tracks. In 1969, the U.S. Army rushed the new M551 Sheridan to Vietnam. This 17 ton light tank was built with an aluminium hull, steel turret, and gun (although the 152 mm gun was called a "launcher" at the time), and could swim across bodies of water. The M551 upon arrival in Vietnam began replacing the M48A3 Patton in all cavalry squadrons, leaving only the M48A3 in the U.S. Army's three armored battalions in Vietnam, the 1/77th, 1/69th, and the 2/34th Armor. The Sheridan needed no modifications for river crossings, crewmen simply raised the cloth sides that were tucked inside rubber tubes along the hull's upper edges, raised the driver's front shield which had an acrylic glass window, the driver turned on his bilge pumps, shifted his transmission lever to water operations and the Sheridan entered the water. For newly arrived Sheridans, this might work as engineered. For "war-weary" M551s, the driver's window was often "yellowed" and/or cracked as to obscure his vision, and the rubber tubes that contained the rolled up side sleeves were often cracked and/or frozen into place. The Sheridan could still cross a body of water, but like its swimming cousin, the M113 APC (Armoured Personnel Carrier, also built of aluminium) the river had to be narrow, less than 100 yards (100 m). In all cases, the bilge pumps had to be working properly, and even then by the time the Sheridan or the APC reached the other side, water would often fill the insides up to their armoured roofs, spilling through the hatches' cracks and emptying onto the earth once safely ashore. Often a fold down trim vane is erected to stop water washing over the bow of the tank and thus reducing the risk of the vehicle being swamped via the driver's hatch. During the Cold War, the Swedish Stridsvagn 103 main battle tank carried flotation gear all the time and was, therefore, theoretically, always amphibious. Hagglunds Bv206 in US military service as M-973 SUSV (small unit support vehicle). The unique capability that distinguishes multi-unit vehicles from single unit ones, is the ability to help each other. According to a 1999 article in Military Parade magazine, multi-unit, all-terrain transport vehicles were first proposed by the British in 1913, and by the 1950s, over 40 types of articulated tracked vehicles (ATVs) were in production. The articulated tracked concept is chosen primarily for its combination of high maneuverability, cross-country abilities, and remarkable load-carrying capacity. In some cases the design is made amphibious, giving them all-terrain capability in the truest sense. Usually, the front unit houses at least the engine, gearboxes, fuel tank(s) and the driver's compartment, and perhaps there is some space left for cargo or passengers, whereas the rear unit is the primary load carrier. Examples of this concept are the Russian Vityaz, Swedish Volvo Bv202 and Hagglunds Bv206 designs, and the Bronco ATTC of Singapore. A highly specialised development is the Arktos expedition and evacuation craft, that uses a linkage with two joints to connect the two units, as well as fitting each unit with its own engine, to give each unit enhanced independence of movement. Some military vehicles are capable of "wading" using waterproof screens to keep the upper hull dry. In World War II the tanks following the Sherman DDs were given waterproofed hulls and trunking was fixed to the engine intakes and exhausts to allow them to come ashore from landing craft in shallow water. The Germans gave their Tiger tank a long snorkel, essentially a long tube on the commander's hatch that allowed it to wade through four metres of water. The Leopard 2 tank can use a series of rings to create a long tube. This tube is then fitted to the crew commander's hatch and provides air and an escape route for the crew. The height of the tube is limited to around three meters. 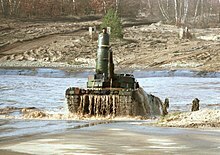 The Russian T-90 tank is also able to perform deep fording operations. The Russian snorkel is only a few inches around and does not provide a crew escape path, but it can be stored on the tank. Some civilian deep wading vehicles achieve their capability by means of legs or stilts to raise the body of the vehicle from its wheels. One example is the Sea tractor, a motor vehicle that can travel through shallow water, with driver and passengers on a raised platform. Another is the Brighton and Rottingdean Seashore Electric Railway, a coastline railway that ran on submerged rails through the shallow coastal waters of the English Channel between 1896 and 1901. An air-cushion vehicle (ACV) or hovercraft can travel over land or water supported by a cushion of air ejected downwards against the surface below it. In principle, a hovercraft can travel over any sufficiently smooth surface: solid, liquid, mixed, or anything in between. Large hovercraft, riding on an air-cushion contained by skirts several meters tall, can deal with obstacles 1 to 2 meters in height. The smallest personal hovercraft are nimble enough to follow some rolling of the terrain. One of the benefits of this type of amphibious craft is the possibility of making them large—the British-built SR.N4 Mk.3 ferries could carry dozens of vehicles. ACVs have a high speed over water (an SR.N4 Mk.1 could do 83 knots (95 mph or 154 km/h)) and can make the transition between land and water at speed—unlike most wheeled or tracked amphibians. Drawbacks are high fuel consumption and noise levels. For some military applications wheeled and tracked amphibious vehicles are slowly being supplanted by air-cushioned landing craft. The hovercraft's ability to distribute its laden weight evenly across the surface below it makes it well suited to the role of amphibious landing craft. The US Navy LCAC can take troops and materials (if necessary an M1 Abrams tank) from ship to shore and can access more than 70% of the world's coastline, as opposed to conventional landing craft, which are only capable of landing along 17% of that coastline. ^ "Marsh Screw Stock Photos and Pictures". Getty Images. Retrieved 13 May 2018. ^ Hanlon, Mike (28 February 2007). "Killer amphibious vehicle - 39 mph on water and 55 mph on land". Gizmag. Retrieved 13 May 2018. ^ "Howe and Howe Tech: Meet The Assault Lander". Discovery Communications. 2 February 2010. Archived from the original on 1 September 2010. Retrieved 13 May 2018. ^ "Raimondo di Sangro - Experiments and Inventions". Museo Cappella Sansevero. Archived from the original on 14 March 2014. Retrieved 13 May 2018. ^ Lubar, Steven (Spring 2006). "Was This America's First Steamboat, Locomotive, and Car?". Invention & Technology. American Heritage. Archived from the original on 22 June 2009. Retrieved 11 August 2014. ^ "Great Citizens - Gail Borden". Houston History. Archived from the original on 13 February 2012. Retrieved 13 May 2018. ^ Owen, Bryant (1999). "The Alligator or Steam Powered Amphibious Warping Tug". Duckworks. Archived from the original on 30 June 2008. Retrieved 11 August 2014. ^ a b Pohl, 1998. ^ "Strange Craft at Home on Water or Land". Popular Science. Bonnier Corporation. 1 April 1931. p. 70. Retrieved 13 May 2018 – via Google Books. ^ "Fastest amphibious car". Guinness World Records. ^ Lloyd, Alex (27 June 2013). "WaterCar Panther, the amphibious off-road vehicle sets sail". Yahoo! Autos. Archived from the original on 1 July 2013. Retrieved 27 June 2013. ^ Shourie, D. (17 February 2006). "Grassroots inventions". The Tribune. Chandigarh, India. ^ Moraga, Ernesto Octavio (21 September 1971). "Cyclo Amphibious (US Patent 3,606,856)". Google Patents. Retrieved 13 May 2018. ^ Hanlon, Mike (4 June 2004). "Shuttle-Bike - convert a bike to a pedal-power boat". Gizmag. Retrieved 13 May 2018. ^ "Motorcycle Innovations: Introducting the Amphibious Motorcycle". American Industrial. 20 November 2015. Retrieved 9 August 2016. ^ Laviolette, Bryan (14 February 2012). "Attorneys: New Classification Needed for High Speed Amphibians". Fast Amphibians. Retrieved 13 May 2018. ^ Laviolette, Bryan (2 July 2010). "With Car/Boat Stalled, Gibbs to Launch Amphibious ATV". The Detroit Bureau. Retrieved 13 May 2018. ^ England-Nelson, Jordan (27 January 2014). "Amphibious WaterCar is a pricey, fast boat, too". The Seattle Times. Retrieved 13 May 2018. ^ "About Us". Spira4u.com. Retrieved 13 May 2018. ^ "Our projects". CMV Amphibie. Retrieved 13 May 2018. ^ Laviolette, Bryan (9 February 2012). "Gibbs Launches 30-foot Phibian High Speed Amphibian". Fast Amphibians. Retrieved 13 May 2018. ^ Woollaston, Victoria (3 September 2015). "All aboard the TANK BOAT! Amphibious Iguana 29 has caterpillar tracks to travel over land and sea at the press of a button". The Daily Mail. Retrieved 9 August 2016. ^ Foss, Christopher F.; McKenzie, Peter (1988). The Vickers Tanks: From Landships to Challenger. Patrick Stephens Limited. p. 28. ISBN 1-85260-141-8. ^ Shangin, Vladimir (February 1999). "Vityaz Transporters From Ishumbai". Military Parade. No. 31. Archived from the original on 16 February 2012. Retrieved 15 April 2007. ^ "Arktos expedition and evacuation". Arktos Craft. Archived from the original on 23 February 2007. Retrieved 13 May 2018. Wikimedia Commons has media related to Amphibious vehicles. The Museum of Creative Invention of multirole vehicles.